A new journey begins, starring Sif�the Berzerker?! When the latest crop of beasties besets Asgardia, our sword-slinging heroine leads the battle charge - but that no-holds-barred zeal for glory may be the very thing that brings the realm down around her winged helm! Finding herself newly minted with an ancient version of the Berzerker spell, Sif returns to an unsuspecting Midgard - and with no patience for relative peace, starts putting out fires with gasoline! And things heat up even more when our heroine falls in with a group of brutal Asgardian savages - and joins them in their millennia-old battle against monsters! But can the berzerkers keep their bloodlust in check? 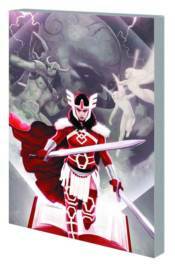 And can Sif master her new abilities and serve Asgard? Guest starring the Superior Spider-Man and a collection of Marvel superstars! Collecting JOURNEY INTO MYSTERY (1952) #646-650.